The 1000 Shawl Knitters pattern was born on my way to the local swimming pool with my daughter. Shopping for sunscreen in a local drugstore we found a table full of cotton yarn on sale, and who could possibly resist pink cotton yarn just waiting to be picked up? Watching my daughter play in the pool I cast on, playing around with a stitch pattern I found on Pinterest the other day. Knitting in the sun, I got a Messenger notification on my cell phone from one of the moderators of my Facebook Shawl Knitting group: We had 980 members currently, and 31 were waiting in the queue to be added. We were about to hit 1000 members after less than one month since the group was founded! I decided the shawl I was working on would be the thousand members celebration shawl for the Shawl Knitting group. Thank you for being part of it! If you’re a member already you know where to get it for free (but today only: June 11th, 2017). 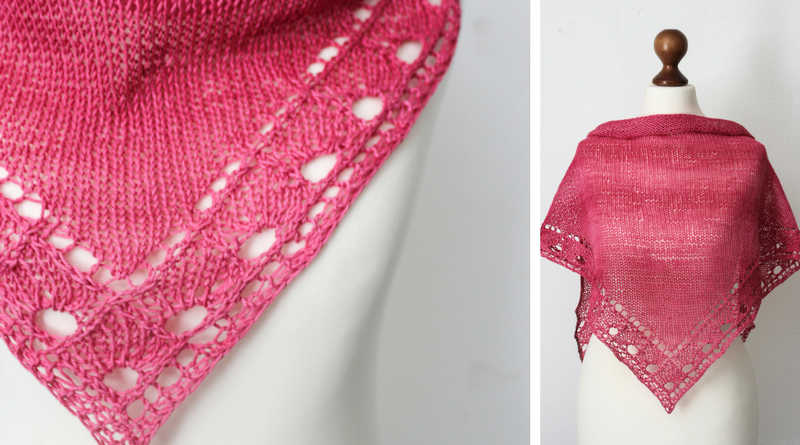 This adjustable triangle shawl is worked bottom up and features a lace border started at the tip and worked along both sides. Once you get the grip on the lace pattern – it’s only a ten row repeat and symmetrical – it becomes easy TV knitting, at least if you’re comfortable with lace knitting. You can get the pattern here in the shop or on Ravelry.